The A-OK Corral and Trophy Mountain / Horse Creek Outfitters are permittees of the BTNF and are proud to be equal opportunity service providers. 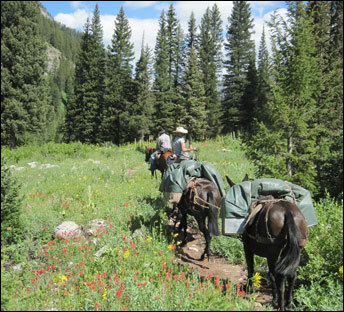 Our pack trips include the whole western experience of camping outdoors in tents, eating home cooked western meals prepared over a campfire, riding horses, and fishing Wyoming's high mountain streams for trout. While you're here enjoy the beautiful mountain scenery, take a hike through lush meadows, see wildlife in their natural habitat, and bring a camera to photograph the beauties you find. 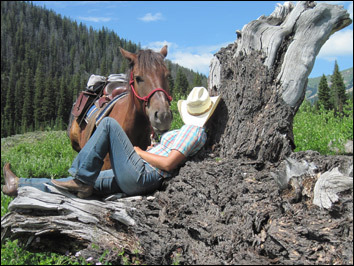 You can't beat Western Wyoming and Jackson Hole for horseback riding, trail riding, fishing trips, sightseeing, and photography! 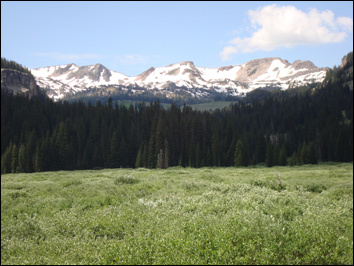 Come and enjoy the breathtaking mountains of Western Wyoming with us. 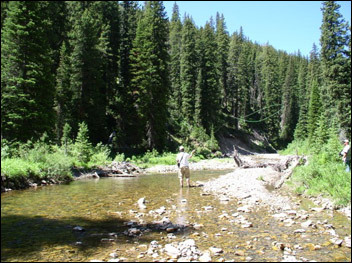 Pack trips take place in the Granite Creek Drainage. 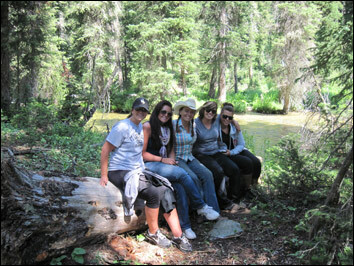 We leave from the Granite Creek Trailhead and from there enjoy fabulous scenery and a great outdoor experience! From the Granite Creek Trailhead it is a 3 hour ride to our comfortable wilderness base camp. You will stay at our base camp in a cozy wall tent. 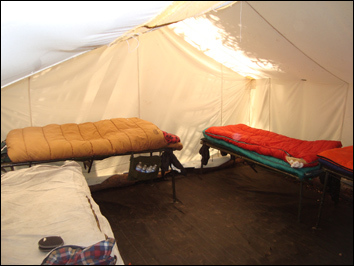 Each sleeping tent is furnished with comfortable cots, mattresses, lantern, lawn chair, and small table. Enjoy a home cooked supper with full fixn's. 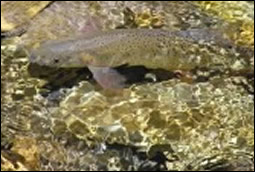 Fish in the nearby stream or just relax and take in the scenery that can only be had in the backcountry of Wyoming. In the morning enjoy a leisurely horseback ride and view the local wildlife: mule deer, elk, moose, and big horn sheep to name a few. On our way out at the end of the trip we can stop off at Granite Hot Springs and you can end your trip with a soak in the natural hot springs pool, (make sure and bring along your bathing suit if a soak is in your plans). Without a doubt this is the absolute best overnight trip in Jackson Hole! We will meet at the A-OK Corral at 9:00 am to check-in. Trips leave the trailhead around 10:30 a.m. and return to the trailhead around 3:00 p.m. the following day. 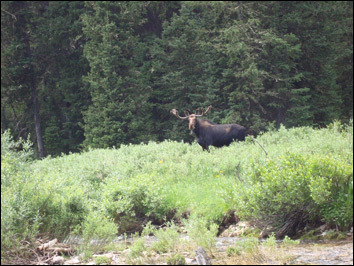 This trip is for the person wanting to see what the backcountry of Wyoming has to offer. We start the trip at the Granite Creek Trailhead and ride to our Granite base camp 3 hours up the trail. After we arrive at camp you can enjoy fishing the nearby stream, taking a hike, go for a horseback ride to view wildlife, or just relax and enjoy the quite solitude of the wilderness. 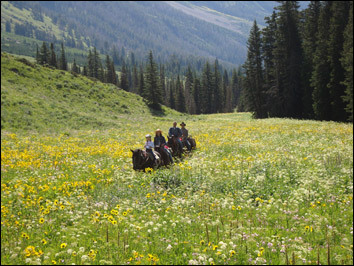 Day two can be spent relaxing and doing activities around the Granite Camp, riding to one of the high mountain lakes in the area, or fishing. On this trip prepare to see some awesome mountain views and breathtaking scenery. An experience of a lifetime! This trip starts in Granite Creek and ends up in Horse Creek. We spend the first night at our Granite Creek Camp, then pack up our gear and ride roughly 5 hours into the Horse Creek Drainage on the second day. We stay the second night at our Horse Creek Camp, and then ride out the third day to the A-OK Corral. We recommend this trip for only experienced riders and for groups without children. Where we ride over a high mountain pass, the conditions have to be permitting. The month of August is the best time to do this trip. -Above prices include food, horse and tack, all camping equipment, (sleeping bags can be provided), fishing gear if needed, guide, and cook. There is a minimum of 2 people per trip. The maximum number of guests is 10. Pick up and drop off in Jackson can be arranged. Our staff is very friendly and professional. We are a family run business and your satisfaction is our guarantee. -Longer trips can also be arranged for an additional $400 per person per day. -Trips begin July 1 and go through August 25. Trips are taken 6 days a week, Monday thru Saturday. Depending on the spring temps we may be able to begin trips sooner. -Meals are hearty western style with full fixn's. A traditional breakfast is served each morning and a full course supper at evening. Sack lunches are provided for the day's activities. Let us know of any special diet requests and we will accommodate the best we can. Base camps are first class and provided with wall tents, 1-2 people per tent, cots, mattresses, lanterns, lawn chair, and small table in each tent. 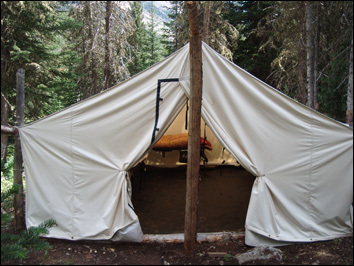 We do have a family wall tent that sleeps 5. 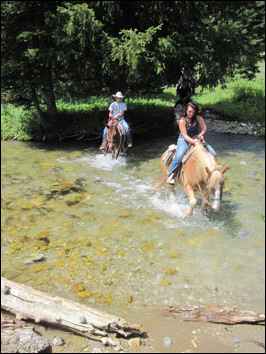 We offer a full day horseback ride with fishing. On these trips we meet at 8:00 in the morning at the A-OK Corral to check in. After riding the horses to some great fishing holes, we spend the day fishing a high mountain stream, enjoy a sack lunch, and then return back to town that afternoon. 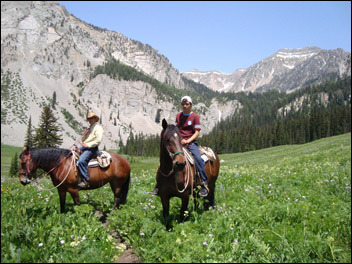 This is a great trip for those who want to enjoy horseback riding and fishing in the mountains, but then return to Jackson for the evening. 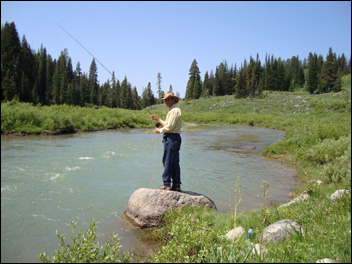 Whether you're an experienced fisherman or a beginner you'll enjoy fishing some of Wyoming's finest rivers and lakes. Enjoy fishing a high mountain stream while you gaze at the snow covered peaks above you on your scenic fishing trip. Let us know what you are looking for at the time of booking your trip and we'll put the perfect fishing trip together for you and your group. You can bring your own fishing gear, or let us know and we will provide gear for you. Includes lunch and fishing gear if needed. Copyright © 2019 Horse Creek Ranch. All rights reserved. Website designed and maintained by Laura Child.